The upgrade to the well regarded E71, with many good improvements on the spec sheet, should be good. Unfortunately it’s riddled with so many problems. I’m quite a Nokia fan but quite disappointed by this model. 1. Sign up for Nokia Messaging is confusing. Do you sign up on line or on the phone? Sign up on the phone and it’s not clear you’re getting an NM account if the email address you use is recognised, or that you aren’t if it’s not. Many don’t understand they are getting an NM account at all or what it is. 2. Fixing your NM account username to the first email address you used is plain daft. There’s no chance to change the username and the password for the whole of NM is tied to that account. 3. NM stopped working. No sync on phone. Tried to log in to email.nokia.com, but it comes up with an error and “try again later” message. Could recover the account briefly with the ‘forgot password’ option, but the account is marked as ‘cancelled’. Contacted Nokia support and they claim it’s active, but still it doesn’t work. Worse is now they’ve changed it so you can’t use ‘forgot password’ any more. NM is dead and support won’t answer emails. Edit: They’ve finally deleted my account and I’m starting again from scratch. 4. Can’t delete NM accounts on the phone if you can’t connect to NM. Daft. 5. The ‘spacebar’ bug. Only hit this once but the spacebar stops working for no good reason. Reboot fixes it. 7. Mail for Exchange just disappeared for no reason. Account gone on the phone and the email set up wizard no longer offers MfE as an option! Edit: Reformatted the phone (again) and got it back. Not good. 8. Firmware update releases staggered across the many variants around the world such that some variants have to wait 6 months or more for the same firmware that’s already released for other variants of the same model, even in the same region. 9. Email client cannot be updated without a firmware update because it is integrated into the firmware. Other, and older models are getting newer clients because they are not integrated. 10. No Destinations support in the email client (except in MfE). Serious drawback as you can’t roam between connections and have to change the settings when moving between wifi APs and also packet data. 11. Now finding the d-pad selector button is tricky. A light press may not be enough, and a hard press will make it ‘select’ twice. 12. ‘Chat’ app has stopped working and just comes up with an authorisation failure error no matter what. Edit: Works again after the aforementioned reformat and reinstalling the chat app from the store. Again not good. 13. ‘Chat’ app only shows (MSN) Messenger as an option with my Vodafone SIM, not Orange (despite using WLAN for the connection and it being an unbranded phone direct from Nokia). 14. A-GPS positioning set to auto in home network only, but when roaming apps keep prompting to use A-GPS. Okay, could set it to not use A-GPS at all, but should be an option to avoid having to change the setting when roaming. 15. Data log seems to have gone screwy with entries from a week ago suddenly appearing at the top but others more recent below them or gone missing. 16. Roaming has caused duplicate calendar entries even though it said it was updating the calendar entries when the time zone changed. 17. IMAP Idle doesn’t work with manually configured IMAP accounts. Evident from the amount of data being consumed when supposedly IDLE. Not the same with NM or MfE (when they work), which consume little data when used in an always on mode (as required for push email). 18. Many new apps being released by Nokia that won’t work with the E72 (and probably other 3rd Ed FP2 models). Instead concentration is on 5th Edition touch and even older 3rd Ed FP1 models. The E72 is supposed to be the new flagship business emailer. 19. Share Online app has stopped working for no reason with a ‘Feature Not Supported’ error. 20. Ovi Store app is showing items it claims I have downloaded that haven’t been downloaded. 21. Okay this may not be an E72 issue, but roaming in the US I’m struggling to get a reliable data connection on AT&T and T-Mobile. In particular the A-GPS connection fails even if I accept it when prompted. Maps fails to log into Facebook to share location (not sure if this is a roaming issue though or just another feature that has stopped working). 22. Maps accuracy without A-GPS is very poor. When navigating it keeps jumping to parallel roads and giving entirely wrong directions (especially annoying in the US with grid like roads). On my old N80 I used a bluetooth GPS and that worked fine, despite not having A-GPS. 23. This may not be an E72 issue either, but the Sky Mobile app doesn’t allow entering of certain characters and numbers meaning you can’t sign in if your username / password have these characters. Could be Sky’s fault though with their app not supporting the E72, but surely there should be nothing special to support if the phone presents the keys in a generic manner? Edit: Sky have just updated their app and it works now. They’ve done a workaround to use native edit boxes when entering username and password. Sky were claiming Nokia at fault, but all works now. 24. IMAP SSL not working in Nokia Messaging. Only plain IMAP servers running on port 143 work. Possibly it works with TLS but it’s hard to tell if it’s actually using it. Ticking the SSL box in NM causes it to fail to connect. 25. SMTP AUTH doesn’t work in Nokia Messaging. Means you can only send mail to an open relay, and the first golden rule of SMTP is you don’t run open relays!. Everyone knows that and SMTP AUTH can’t be hard to implement as it’s in every email client under the sun! This is required to connect to many ISPs and certainly for home run mail servers. That said though, if you don’t fill in an SMTP server, it appears it will use NM’s own SMTP server instead. A workaround at least. 26. Can’t configure NM to connect periodically. It’s always on or always off. Okay, that’s push email really, but connecting every 5 or 10 minutes would save battery, and NM servers seem to only pick up mail every 15 minutes anyway (another annoyance, but perhaps understandable given the volume of traffic an almost instant service would generate). 27. Sent mail is copied to ‘Sent items’ but there’s no way of changing that if your mail server uses a different folder name for sent items. 28. Repeated calendar alarms go off silent. i.e. just flashing display, no tone or vibrate. I think it’s if you haven’t acknowledged or silenced it after the first time it goes off it then goes off again silent which is kind of pointless for a repeating alarm. 29. Pager profile I believe should vibrate when receiving a call (it did on the N80), but it doesn’t. Swap the SIM (as I often do for work purposes) and it will auto set the operator settings for the new SIM, changing it all over the place and taking priority over your preferred WLAN settings (e.g. you have a WLAN as your choice for the web browser, and it changes it to Orange or Vodafone or whatever). Result is I have to change my settings back to what I want every time I swap SIMs (which I do daily). Vodafone UK PAYG SIM always ends up with pay monthly settings which don’t work and needs to be provisioned online to get the correct settings. 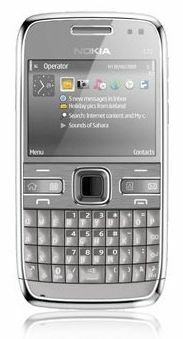 On the plus side, the E72 is a nice design, feels good, the keys are easy to use, the build feels solid (with the exception of a slightly loose feeling battery cover, although it doesn’t fall off). Battery life is excellent and the display looks fine for a QVGA display. The hardware is basically fine. The software is really broken.